There are thriller writers, and then there are thriller writers. Brad Thor, #1 NEW YORK TIMES bestselling author of twelve novels, is a thriller writer with a capital ‘T’. Ever since he first introduced the world to series hero Scot Harvath, Thor has captivated readers with some of the most gripping and genuinely terrifying books on the market today, weaving real-world threats and tight plotting into narratives that read like tomorrow’s headlines. And on July 9th, he will do it again, taking readers on another hair-raising adventure with his 13th thriller, HIDDEN ORDER. I had the pleasure of sitting down with Brad recently and talking with him about his new project. Where did the idea for HIDDEN ORDER come from? When 9/11 happened, my wife and I got stranded on the east coast. We were supposed to be taking a trip to Greece, but all the flights were grounded. We ended up making our way to a tiny island off the coast of Georgia called Jekyll Island. It was there that the idea for HIDDEN ORDER was born. I learned about an organization more secretive than the CIA or even the NSA. Some say it is more powerful than the United States government itself. Everything about this organization – from the efforts it takes to keep its real work hidden, to the influence it wields around the world – reads like it has been pulled from the pages of an actual thriller. 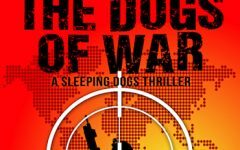 You are well known for your “faction” genre of thrillers, blending real-world hot button issues with compelling plots, to the point where many look to your novels to find the likely threats of tomorrow. Are readers going to see this in HIDDEN ORDER? Absolutely. The greatest compliment I get from readers is that they love reading my novels with their laptops open. They’ll read something in one of my books and say, “There’s no way that can be true.” Then they’ll do a search for it and be blown away to discover that it is true. I like challenging people with my books. It’s fun to blur the line between fact and fiction. That said, my novels exist on two levels. If you want to skim across the surface of the water with an exciting, toes-in-the-sand-book-in-the-hand beach read, that’s there for you. If you want to do a deep dive into all of the engaging real-world elements that’s there for you too. First and foremost, I’m an entertainer. It’s my job to give the absolute best, white-knuckle thrill ride I am capable of. If I have done that, I have succeeded. But if you finish one of my thrillers smarter, more knowledgeable about a fascinating or important subject, then that’s icing on the cake. This is your twelfth thriller featuring Scot Harvath and your fans keep clamoring for more. What makes Harvath particularly engrossing and/or unique as a series character? Harvath embodies many of the qualities I respect in the people around me – particularly in the military and intelligence worlds. He’s smart, he’s brave, he’s loyal, and he’s courageous. He’s also a badass – the kind of guy you’d want with you in a bar fight. He’s not perfect, but he tries his best and I think that’s something we all can relate to. How much of yourself do you put in your characters? With which character in HIDDEN ORDER do you most identify? Other than HIDDEN ORDER, what is your favorite book you’ve written? Why? That’s a tough question, because there are two: BLACK LIST and THE LAST PATRIOT. I loved researching BLACK LIST (which presaged the entire NSA scandal). The explosion in “total surveillance” and “total information awareness” was terrifying to learn about. The current surveillance programs in the news have nothing on what’s in the pipeline. THE LAST PATRIOT was also fascinating to research. It was also fun to write and I really enjoyed weaving clues from the 7th and 18th Centuries into a fast-paced, contemporary thriller. What is your favorite book by another author? Why? I read voraciously in our genre and love Nelson DeMille, David Morrell, Jim Rollins, and Steve Berry. I am honored not only to read them, but to know them. They are all great guys who really, really know how to write and keep you flipping those pages. What is your favorite travel destination? Why? The Greek Islands – the quieter and more remote the island, the better. It is a gift to be able to unplug, unwind, and do nothing at all. It is my absolute dream job. I can’t see myself doing anything else. I love the art of creating. I also like to challenge myself. I work hard to make each book I am writing the best book I have ever written. My favorite part of my job, though, is my connection with my readers. They’re the nicest, coolest people you could ever meet. What is one thing that would surprise your fans about you or your writing process? I kicked a future Bond girl off my couch and out of my college apartment for not paying rent. What can we expect next from you, and where can readers go to hear the latest news? My newsletter at BradThor.com is the best way to stay in touch. All the big news breaks there first. Plus, each month the newsletter contains a contest with a different, awesome prize / piece of gear. As far as what’s coming next, I am working on my 2014 Scot Harvath thriller as well as a new ATHENA PROJECT novel. We also have a couple of very cool surprises in store for readers that we’ll be unveiling at BradThor.com soon. A tremendous thank you to Brad Thor for his taking the time out of his busy schedule to take readers behind the curtain of the author whose stories take us behind the curtain of our modern world. If you haven’t discovered his books for yourself, now’s the time to start. Prepare to be entertained and illuminated with the latest Scot Harvath adventure when HIDDEN ORDER hits stores on July 9th. Brad Thor has served as a member of the Department of Homeland Security’s Analytic Red Cell Program and is the #1 NEW YORK TIMES bestselling author of twelve previous thrillers. He has appeared on Fox News Channel, MSNBC, CNN, CNN Headline News, ABC, CBS, NBC, PBS and The Blaze as a National Security Expert to discuss terrorism, as well as how closely his novels of international intrigue parallel the real threats facing the world today. Jeremy Burns is the author of the historical conspiracy thriller, From The Ashes. Like his protagonist, Jonathan Rickner, Jeremy is holds a degree in history, has lived overseas for several years, and is an intrepid explorer whose own adventures have taken to more than twenty countries across four continents. When not exploring a new corner of the globe, Jeremy lives in Florida, where he is working on his next thrilling novel.